If you were born between the early 1940s and the early 1960s, you are considered a baby boomer. And that means that in the year 2017, you are considered to be at the late stage of your career. However, as we all know, times have changed. Very few people can expect to start at a company in their 20s and retire with a gold watch in their 60s. Layoffs and downsizing are commonplace. 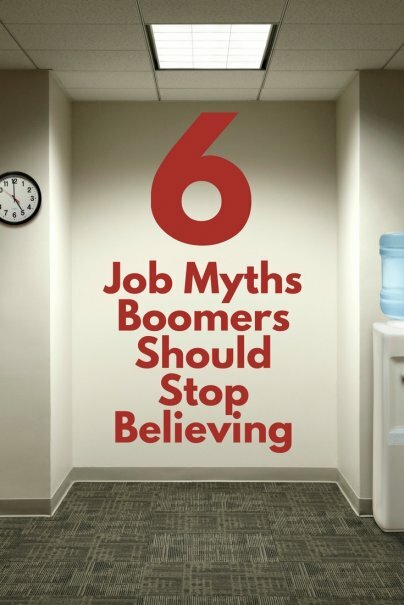 But with these employment fears come myths that many baby boomers still firmly believe in. It's time to bust them once and for all. Let's make it clear: Getting a job in your 20s and 30s is always going to be easier than getting hired in your 50s and 60s. There are certain expectations about pay, and as we get older, we have more health concerns and less energy than we did at the start of our careers. But there's a difference between hard and impossible. If you have the skills, the drive, and the right attitude, you will be valued and you will get job offers. The key is to stop shooting yourself in the foot by believing that your age is an anchor. There are pros and cons for every stage of our career. Early on, we're too young and have no experience, but we're cheaper and are willing to work longer hours. At the height of our careers, we sacrifice time with our families for ladder-climbing, but the pay and rewards are there. Later, we can be considered too expensive for the open positions, but we have the experience and wisdom that employers crave. It's all give and take. Market yourself with the strengths that come from a long and successful career, and how those strengths can benefit your potential new boss. They say you can't teach an old dog new tricks, but that's a complete fallacy. In fact, to continue the analogy, skilled animal trainers can take an old dog with behavioral problems, and make it a loving, family-friendly pet. While it's true that it's a little harder to pick up certain skills later in life, it's not even close to being unmanageable. As The Telegraph reported in 2014, more middle-aged workers are retraining for new careers as a response to their original careers dying out, or being too physically taxing. And in 2013, almost 12,000 people over age 50 in the U.K. found apprenticeships in health care and public services. In 2015, Time magazine reported that the job market was hot for workers over the age of 50. You've probably heard some of these degrading statements thrown around the office (or even used them yourself at the start of your career): "That guy's a dinosaur, don't listen to him," or "She's been here for decades, she's not up on the latest news." It's complete nonsense. With age comes experience and wisdom, and the ability to solve problems much faster than those who are just starting to climb the ladder. Consider the story of Picasso. One day he was sketching in the park, when he was approached by a young woman who asked him to sketch her portrait. In a single pencil stroke that took just a few seconds, he captured her likeness completely. When asked how much she owed him, he said $5,000. Taken aback, she asked how he dare ask so much for something that took only a few seconds, to which he replied, "Madame, it took me my entire life." This is so true of the experience you bring to the table. You have spent decades learning how to do things, how not to do things, and how to cut to the chase. Time is valued by employers, and if you can prove that your skills can save them time and money, age is just a number. Retirement is not forever. You may decide to retire, then realize that you still want to be part of the workforce. Don't think that a gap of a few years at the end of your resume is going to tarnish it. The break between one career and a new venture is actually going to be looked upon favorably by employers. They will see that you have taken time off to reboot, clear your head, relax, and figure out how you want to spend the next decade of your life. So, feel free to take a break and recharge. Use the time to work out what you really want to do. Maybe retirement is just what you want. Maybe you want to try your hand at something completely different. When you start looking again, you will have options open to you. Once again, this is untrue in the present climate. In 1995, you could make a case for that argument. Back then, around 56 percent of the over-65 workforce was part time, with 44 percent being full-time. But by 2007, those figures had completely reversed, with 56 percent of the over-65 workforce now in full-time work, and just 44 percent doing part-time jobs. So, what kind of jobs are available? Well, according to the Bureau of Labor Statistics, the majority of people over 55 are working in management positions, sales, and office jobs. Next comes the service industry, followed by production, transportation, construction, and maintenance. If the last two seem surprising, consider that we are living longer, and have made great advances in medical care. It's now possible for a 55+ man or woman to enter the construction and maintenance industries and enjoy great success, despite what they may believe about being too old for manual labor. Greeter at a grocery store. Fast food server. Security guard at the mall. Delivering newspapers. Driving a cab or a school bus. The list goes on. These are the jobs many baby boomers think are in their future. However, while those jobs are available for those who genuinely want them, your options are much broader, and exciting. One of the most popular options right now is retraining to become an interior designer. If you have the eye for it, you can make great money on a schedule that suits you. Other options include working on a cruise ship, planning weddings, public speaking, casino work, consulting, and seasonal opportunities at ski lodges and resorts. The world is your oyster, especially if you're open to doing some traveling and taking a few leaps. Remember: As a baby boomer, you may have fewer years of your career in front of you than behind you, but that does not mean you have just a few paths to follow. With drive, enthusiasm, and the willingness to retrain, you can do almost anything you set your mind to.